Father Michael's Number Three Rule for the Interior Life: Be Yourself. The Twenty-Second Monday of Ordinary Time. 10:43 AM 9/1/2014 — We have today a lovely Gospel lesson of which we could all speak volumes, but we've been looking recently at St. Paul in Corinth; and, if it's all right with you, I'd like to stick with him, at least for today. Just to review: we had looked at the history of this great city of Corinth, what it had been in the past, what it had become at the time the Apostle arrives there. We had also looked at what had happened to the Apostle on his way there, during his preaching tour through Greece, and how it had been, up to that point, a colossal failure, particularly in Athens, on which he had pinned such hope. Of course, his First Letter to the Corinthians, from which we are reading, was written after he had left there, and today St. Paul indulges in a little retrospective regarding when he first got there. So it was, brethren, that when I came to you and preached Christ’s message to you, I did so without any high pretensions to eloquence, or to philosophy [like I did in Athens]. I had no thought of bringing you any other knowledge than that of Jesus Christ, and of him as crucified. It was with distrust of myself, full of anxious fear, that I approached you; my preaching, my message depended on no persuasive language, devised by human wisdom, but rather on the proof I gave you of spiritual power; God’s power, not man’s wisdom, was to be the foundation of your faith (I Cor. 2: 1-5). So, the lesson for us we could say is Father Michael's Number Three Rule for the Interior Life. I've given you the first two: (1) mind your own business, and (2) don't look for the results of your efforts. Today you have the third: be yourself. Don't try to pretend to be something you're not. 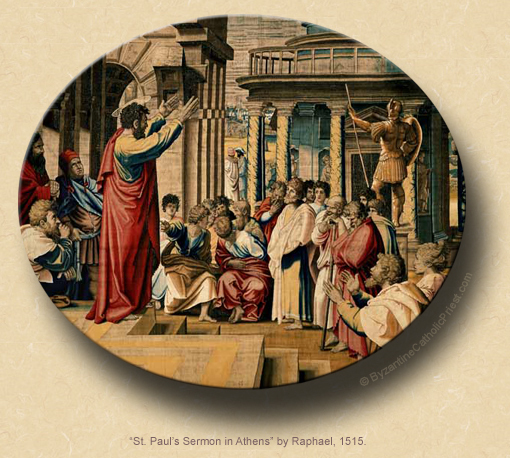 St. Paul tried it with the Athenians and it was a dismal disaster. When he got to Corinth, which was an Athens wannabe, he took a different approach, presenting both himself and the Gospel for what they were; and, the results, as we had already observed last week, were astounding.